Here are the seminars we will be presenting. Hope to see a lot of you there! All our seminars are located in Thurber Hall, Room 1. If you can’t be there and you’d like the seminar handout, they are all available on our Seminar Handouts folder in Dropbox. Monday at 3 – 4 p.m. Your smartphone and/or tablet may be the only computer you need as you travel. We will compare and contrast iPhone/iPad, Android, and Windows 8. We’ll explain how they work, what they cost and what you can do with them. Every RVer Needs a Blog! Tuesday at 1:30 – 2:30 p.m. Join the fascinating and rewarding world of Blogging! We’ll show you step by step how to create your own weblog using Blogger.com. Share your travels with family and friends. It’s FREE and oh, so easy. Wednesday at 10 -11 a.m. You’ve probably been to the Google Maps website to search for a destination. But did you know that you can plan a multistop route and print out the directions and create and save custom maps? You can even include your photos, links, and descriptions. Let the Geeks show you how! Wednesday at 1:30 – 2:30 p.m. Your computer is in your lap, but your pictures and files are in the Cloud. How does that work? What is the Cloud? We’ll demonstrate three of the most popular cloud services. Learn about Dropbox, OneDrive, and Google Plus Photos. Here are the seminars we will be teaching at the FMCA Pomona convention, March 26-29. Technology for Travelers Friday 11:30-12:45 Seminar 9 Laptops, smartphones and tablets all have something to offer travelers. Jim and Chris Guld of Geeks on Tour have compiled a list of their favorite uses of technology. Research and plan your travels with maps, apps, and GPS devices. Stay safe with weather and emergency information. Take memorable photos with your smartphones, organize and share them with today’s cloud services, use social networks to meet and greet others in this journey and keep your story in a Blog. In this overview seminar they will demonstrate each and also provide a list of resources where you can learn more. Are you wondering what to do with all those pictures you take on your travels? Have you heard of “The Cloud” but don’t understand it? This seminar will focus on using Google+ photos (in the cloud) because it works with both Apple and Android devices, but we will also give an explanation of Apple’s iCloud and iCloud Photos. Google+ is so automatic, the photos you take with your phone or tablet may already be in the cloud! We’ll show you how to find them! If you do it right, you have unlimited free cloud storage for all your photos. We will explain and demonstrate how it works, how you can see all your pictures whether you’re using a computer, phone, or tablet and share your photos with any of your family or friends by simply sending them a link. You can also use your cloud-based photos in a Blog. You can create and save custom maps to record your travels and share them with friends and family. Your custom maps can even include your photos, links, and descriptions. This seminar will show you how! Also use Google My Maps to keep track of places you may want to go in the future – a wishlist, or bucket list! It works on both the computer or your mobile device, so anytime you get an idea you can add it to your map complete with any notes or pictures you need to describe it. Jim and Chris Guld of Geeks on Tour will present this seminar, you can see their maps on their blog at GeeksOnTour.blogspot.com and click the tab for Our Maps. How many times a day do you have an idea, or receive a piece of information and think to yourself, “How am I going to remember this?” or “Where should I put this so I can find it later?” The answer to those questions is Evernote. It’s a free note-taking and information gathering website (Evernote.com) that also has Apps for Apple and Android devices. Whichever device you have available – all your information is there! You can leave yourself voice notes. You can even use it to snap photos of receipts, business cards, or Dr. reports and be able to search for them later. You can search for any word contained in the snapshot! This seminar is a step by step How To taught by Jim and Chris Guld of Geeks on Tour. Using both Android and Apple devices, Jim and Chris of Geeks on Tour will demonstrate as many Apps, Techniques, and Features as time will allow in this rapid-fire, fun-filled seminar. They will draw material from their weekly online show (GeeksOnTour.com/weeklyshow) that they have been producing for over a year. From simple, but hidden features like how to alphabetized your iPad’s icons, to amazing Android Apps that will record your hike and let you later fly through it with Google Earth, to everyday but oh-so-useful ways to find out information like the name of the county you’re in! Watch Jim and Chris as each tries to outdo the other in finding, explaining, and demonstrating their favorite tips. Seminar includes a handout with all tips listed and references to learn more. Picasa is free software by Google for Windows and Mac computers. 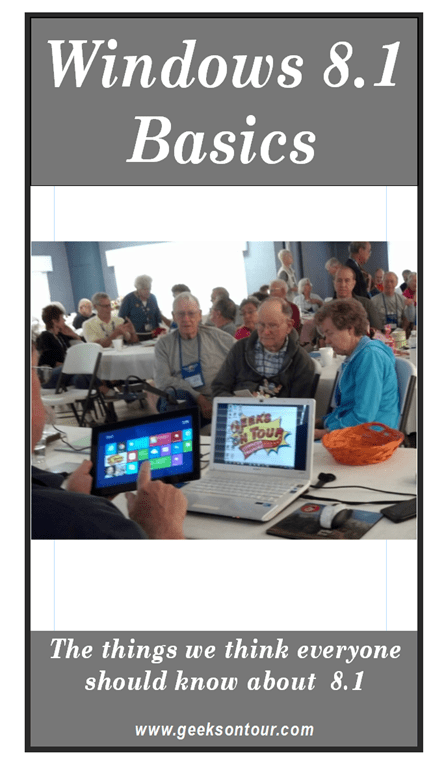 Chris and Jim Guld of Geeks on Tour are specialists in teaching Picasa. See their dedicated website, PicasaGeeks.com. This seminar will focus on Picasa’s photo editing capabilities, from simple cropping and straightening, to making skies bluer, retouching blemishes, and framing pictures. Pictures that you thought were trash can be turned into treasures with a few simple clicks. This seminar will also teach how to make collages and give you resources to learn more. Learn by Doing! This 3 hour, hands-on class is open to anyone with Android phones or tablets as well as iPhones and iPads. Bring your device fully charged, and a charging cable just in case! We’ll start with the basics of taking pictures, selfies, and videos, then move on from there! You’ll learn what that HDR setting means and how to use it. How to take Panoramas, see your pictures in place on a map, and other special features. That camera lens is not just for capturing memories – you can also capture documents (no need for a scanner or fax!) or scan QR codes that get you discounts at your favorite store. This class is limited to 20 people. Pre-registration and a $20 fee is required. Sign up at the Geeks on Tour table in the Information Center. Meet Jim and Chris. They live full time in an RV and make extensive use of computers and technology to Plan, Preserve, and Share their travels. Their business, Geeks on Tour, is teaching you about the devices and software they think are the easiest and most useful.You will learn how they use smartphones and cellular technology for their Internet connections, what mapping and GPS technology they like best, how they manage thousands of digital pictures on their computers and post the best ones online for free and lastly, how to share all your experiences online with friends and family using Blogs and Photo Albums. Whether you’ve had a smartphone or tablet for years, or you’re just thinking about getting one, you will learn something in this seminar. We start with explaining what these devices are and what extra costs they incur. We will discuss the features that are important to travelers: hotspot capability, GPS, Cameras, and Bluetooth, and give you our short list of must-have travel Apps. We will demonstrate how to install a QR code scanner and use it to find the information stored behind those funny looking square codes. We will show you some basic ways to customize your phone to your liking with various settings and home screen organizations. Jan 14: Smartphone Photography – a hands-on class. Imagine starting a family website when a grandchild is born, adding stories and pictures throughout the years and having a beautiful coffee table book to give to that grandchild when they graduate High School. Or … when you take that trip of a lifetime, you could have an easy-to-maintain website for the stories and photos of that trip, then print a coffee table book to remember the trip for years to come. Or … if you have a hobby, club, or small business to share with the world, a website is the way to do it! Or … all of the above. This seminar will introduce you to Google’s free website and photo tools, Blogger.com and Picasa photo software. Learn how to start a Blog/Website and add stories and photos with Geeks on Tour’s easy to understand, step-by-step instructions. You’ve probably been to the Google Maps website to search for a destination. But did you know that you can plan a multi-stop route and print out the directions? You can create and save custom maps to record your travels and share them with friends and family. Your custom maps can even include your photos, links, and descriptions. This seminar will show you how! Geeks on Tour at a Rally? What is an RV Rally you might ask? It’s like a convention, but instead of staying in a hotel room, the attendees all bring their own houses! It needs to be held at someplace with lots of spacious parking. There can be thousands of RVs. In this post we’ll take you day by day thru the Geeks on Tour activities at the Escapade rally held in Goshen, Indiana at the Elkhart county fairgrounds. A Big Thank You to the Escapees RV club for organizing such a great rally. We felt like you did it just for us! And you made us feel like royalty. We know there many other excellent seminars, and a lot of other fun stuff going on, but we saw very little of it. First came a hands-on, 6 hour class on Windows 8. The people who came to the class saying, “I Hate Windows 8!” had all changed their tune by the end of the day. We taught them how to make the tiled Start Screen more useable by customizing it, or to bypass it altogether and just use the old-fashioned desktop. We taught them how to use the OneDrive folder on the computer to automatically backup and/or share files in the Cloud with OneDrive and their Microsoft account. We taught them how to Search, so they didn’t get frustrated by not finding stuff. And, we taught them how to specify that they were using a “Metered” Internet connection. That way, Windows 8 will refrain from doing all those big Uploads and Downloads when you’re using that connection. Next came two half-day classes, the first on Android phones and tablets, and the second on iPhones and iPads. These didn’t go as smoothly, but people told us they learned a lot. A big problem was that we were in a metal building. Have you heard the term Faraday cage? That’s what you build (a metal enclosure) if you want to block all electromagnetic radiation, including most radio waves. Guess what, cellular signal is radio waves. It was really tough to teach cell phones with no cell signal! Luckily, the WiFiRanger company was a sponsor of the Rally, and Kelly Hogan was onsite with lots of special equipment for receiving and rebroadcasting Wi-Fi connections. We asked Kelly if he could do anything for us, and he was in our classroom quick as a flash with antennas, routers, and his special Internet connection to a local provider. At the very least, our students learned how to connect to a Wi-Fi hotspot when cell signal is not available! They also learned how to scan QR codes, turn their phone into a hotspot, customize their homescreens, use Google Maps, and use the camera app. We had one couple (Pam and Kirk Wood) in our iPhone class who told us they learned more in this 3 hour class than in the 4 years they’ve owned their phones! The iPhone class also had the added benefit of wisdom from our friends at Technomadia.com who volunteered to help teach. When we weren’t teaching, we were in what Escapade calls the Marketplace. Since we don’t have products to sell (just memberships), we don’t need much of a booth. Jim made a portable Tiki bar a few years ago that he occasionally sets up outside the RV for happy hour. Then we came up with the name “Geeky Tiki” and we decided that’s all we need for a booth. We were set up next to our friends from TechnoRV, and they were a great help to sign people up for Geeks on Tour membership when we weren’t there. We started the week of seminars with our “Technology for Travelers” This is an overview of everything we teach: How we Plan, Preserve, and Share our Travels using Technology. You can download the seminar handout here. We show our Blog and how easy it is to make one yourself, for free with Blogger.com. We share how we connect our computers to the Internet as we travel by making our phones into Wi-Fi hotspots. Then we discussed what mapping programs we use to plan our travels and navigate along the way. We showed one of our tutorial videos on planning a route using MS Streets and Trips. S&T is just for Windows though, so we also demonstrated the web-based trip planning system called RVTripWizard.com – we like this one because it calculates the date you will arrive at any given destination along your route. Then we show how both Google Maps on our phones, Rand McNally on the dashboard GPS unit 7720, and CoPilot on the Nexus 7 tablet, help us navigate each day on the road. And, that’s just the Plan part! For Preserve – we’re mostly talking about preserving your travels with pictures and managing those pictures with Picasa. We had to stop at one hour, but this seminar was scheduled to be repeated on the last day of the rally, and we had 2 hours on the schedule then! Here’s a picture of our audience for this first seminar. I racked my brain trying to figure out what we could skip in teaching our Picasa seminar because we only had an hour and we NEED an hour and a half. We like to have two hours! Picasa is a specialty of ours – we have an entire website, PicasaGeeks.com. I just couldn’t cut anything out, so we went really fast! We took pictures of the audience, imported them to an Escapade folder on the computer using Picasa’s import tool. Showed how to add captions, did a little editing, showed a video on how to rename folders and organize pictures, put the pictures we took into a collage, and uploaded that collage to Picasa Web Albums aka Google+ Photos where we could share it with you! Whew! Here’s the seminar handout for Picasa. This is one of the first seminars we ever presented back in 2005 … second only to Internet on the Road. It has never been one of our most popular titles, but blogging has probably been the most important technology tool for our travels. We’ve been keeping our blog since we first came up with the idea of fulltime RVing, and we’ve been using Blogger the whole time. Our blog has become so important, I’ve taken advantage of a website called Blog2Print to get hard-bound books made. We had the books at the seminar for show and tell. Then we started at the beginning with how to create a Blog. We showed how to add pictures, make hyperlinks, and even how to embed a video into a blog post. 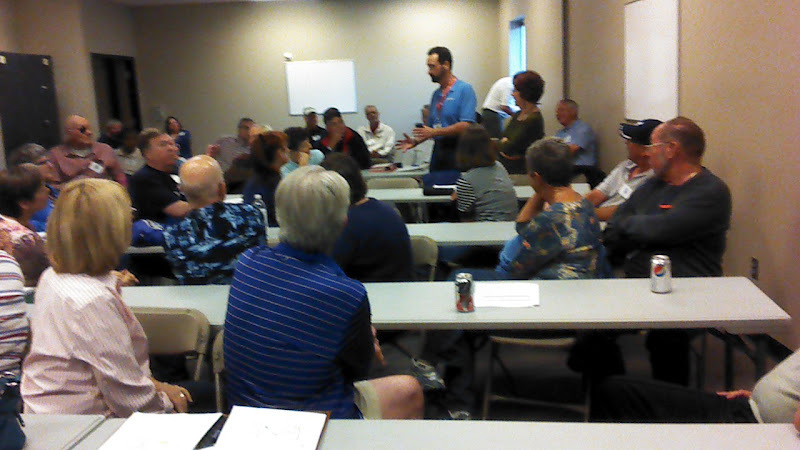 We were SO happy to have a good turnout for the blogging class since we truly do believe that Every RVer Needs a Blog! Several people came up to us afterward and related that they’ve had their blogs for years now and they learned from Geeks on Tour! I think we need to give them a graphic ‘badge’ to put on their blog that reads, “I Learned from Geeks on Tour.” If this is you, please contact us and we’ll get it set up. Here’s the seminar handout for the Blogger class. By the third day, our audiences usually are dwindling – there’s so much to do at these rallies. But that was not the case this time. Google Maps had our largest audience yet. It was only after the rally was over that I thumbed thru our latest issue of the Escapees magazine and notice an article about Google Maps! Then I noticed that Chris Guld was the author! I had completely forgotten about that – I wonder if it explains our large crowd? Anyway, Google Maps is getting cooler every day. We showed how to research a location and see photos, and street view in addition to maps. We showed how to manage the Directions feature of Google Maps and to print out those directions or re-route according to your desires. Last, but not least, we showed how to make your own custom maps to preserve your travels, including routes, stops, photos, blog posts, and videos. Google Maps puts it all together. See the map of our 2013 travels for an example. Feel free to download our Google Maps seminar handout .. just remember these are for personal use only. Here’s our awesome audience for Google Maps. I had to use the Panorama mode on my new Samsung phone to get in the whole audience! Here’s the handout for Cloud Computing. People are very confused about how to use Cloud Computing. There’s a good reason for that! It IS confusing. We did our best to explain it, and our handout gives the specs for the major consumer cloud computing services: Dropbox, OneDrive, Google Drive, and iCloud. On the one hand, “Cloud” simply means the Web, the Internet. We used to call Blogger “Web-based” software, now it’s called “Cloud-based.” The power of the Cloud is that it gives us device independence, we demonstrated how you can take a picture with your phone, that picture can go to the cloud, and then you can use your iPad to write a blog post and insert that same picture. It doesn’t matter what device you’re using if your stuff is in the cloud. We also demonstrated how using services like OneDrive or Dropbox can keep your files in the Cloud AND synchronize them with your computer. The best of both worlds. To demonstrate, we took a picture of the front row (including our longtime Geeks on Tour members Bill Osborne and David Cross) and let the audience watch as that picture appeared on our computer within seconds. Dropbox automatically uploaded the picture to the Cloud, and then downloaded that same picture to my computer. Now I can safely delete the picture from my phone to free up space. The number one question we got over and over, “Does this feature use my cellular data?” The answer was almost always Yes. It’s a great service, but you need to understand and control it so you don’t end up with a $500 Verizon bill unexpectedly! Dropbox, for example has settings to tell it to only perform the uploads and downloads when your phone is connected to a Wi-Fi hotspot, not cellular. This was our last seminar, on the last day when everything was winding down. We still had a great crowd and most of them had been in several of our seminars during the week, so they had lots of questions. We had a full two and a half hours on the schedule for this one so we just answered questions, and more questions. These people felt like our closest friends by this point, and we just had a good time! We asked for a show of hands if anyone was seeing us for the first time in this seminar – only 3 raised their hands! We still made sure to cover some of the information that we didn’t get to the first time, including how to make a movie using MovieMaker – that’s how we made this Ham-O-Rama video. Thanks Connie Bradish for these photos! 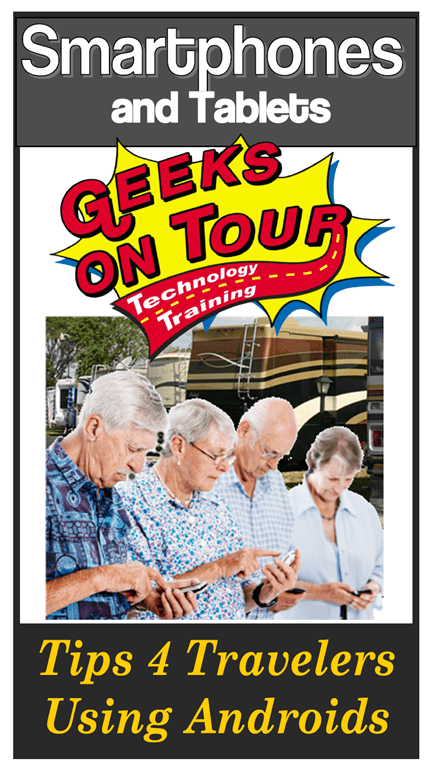 If you’re interested in Geeks on Tour seminars for your group, please contact us. If you’re interested in learning more on the topics we teach, sign up for our Free Newsletters. Or, better yet, Become a Member! Geeks on Tour is 100% member supported – no advertising, no product sales or sponsorships, just teaching. This past week we were at the Camping World / Good Sam Rally held at the Atlanta Motor Speedway. We were parked in the Infield, along with a few hundred of our close RVing friends! Another 1-2,000 RVs were parked outside the track area. We gave 14 classes in all over the 5 days of the rally. Four of them were our special hands-on classes for iPhones/iPads and Android devices. We kept registrations under 20 people so they could get personal attention as we gave them exercises to do. There was only once that we left our tent and wandered around the vendor Exhibit hall. We were happy to see the TechnoRV booth looking busy and a big smile from Ally handling business while Phil and Tracey are still in England. We did take advantage of the Entertainment on Friday night and went to see the Beach Boys. They were great! And it was a beautiful evening at the Atlanta Motor Speedway. We were very happy to have Devon (Jim’s son) with us. We got to spend some quality time with him, and he was a great help signing people up for Geeks on Tour memberships after each seminar. I think it was fun for him to get a glimpse of how his crazy parents live! This is the second time he’s helped us at a Rally – wish he could always be there, but I don’t think it’s going to work to fly him to Oregon. Hopefully he’ll join us in Perry, GA in March for the FMCA rally. Thanks to Devon’s help, we are welcoming over 90 new Geeks on Tour Members! The last night we breathed a sigh of relief and enjoyed a nice dinner and bottle of wine with our parking lot neighbors and friends Chris and Charles Yust of C & C RV Insurance. Mountains, streams, and lakes are pretty, but we enjoy the parking lot just as much! The Windows 8 seminar was a first for us, and the Movie Maker seminar is one we’ve only given once and the computer didn’t work so well. This time we used a different computer for the Movie Maker and we made sure to practice the Windows 8 seminar – so they both went well. If you attended a seminar when we ran out of handouts, or you weren’t able to attend, all of our seminar handouts can be downloaded from our website. We LOVE doing this! So many people came up to us to say thank you! Some said they felt SO smart now because they learned so much from our seminars. Others told us they needed some down time because their brains were overflowing with all the information we presented. The most popular class was the smartphone overview. WoW. The only picture I snapped was this panorama with my Droid phone. I apparently didn’t hold the camera well cuz it’s a bit blurry, but you get the idea – it was a packed house! Teaching smartphones is just sooo much fun, the main comment we hear as people leave is, “I had no idea they could do so much!” We especially like showing Google Translate. As long as you have your phone, and an internet connection, you will be able to speak the language of whatever country you’re visiting – or your phone will at least. And, it’s free! Just unbelievable. We also show a video clip from NBCNews that explains the amazing medical uses of smartphones. And Jim got to show off his Windows 8 Microsoft Surface Pro Tablet/computer. We met a couple other people at the rally who had the Surface Pro and they loved theirs just as much! When we weren’t teaching a seminar we were at our booth in the exhibit hall. It was great getting to see our friend Phil May, of TechnoRV – our booths were right next to each other so we took down the barriers to make a TechnoGeek booth! The Verizon booth was nearby and I think I recognized most of the people buying phones because they attended our smartphone class – then had to buy one! Too bad we don’t make any commission eh? Just kidding, we don’t want any commission. That’s why people trust our information so much – we don’t make anything from it. Our sole source of income is from our members who learn from us. It was a busy, busy week, but we still found time for some fun as well. Here’s our parking space, and we were right next to Nick and Terry Russell of Gypsy Journal fame. We spent a couple of evenings just swapping tales – it was nice to catch up with them, although my sides did hurt afterwards from laughing at Nick’s stories! Thank You to Bob and Molly Pinner – the directors of the Escapade, and Cathie Carr – the President of Escapees. We had a great time! FMCA is the Family MotorCoach Association. We’ve been giving seminars at their rallies since 2005. We plan our travels around the national rallies, which is why we’re in Wyoming this summer. Attending a big RV rally is a unique experience. Don’t plan on wilderness camping! Here is a typical parking arrangement. You’ve got to be friendly! I wrote a post for RV.net a while back called 7 Steps to Enjoying a Big RV Rally that you may want to read if you’re thinking of attending one. It was perfectly gorgeous weather for the majority of the week, BUT, it just takes one nasty thunderstorm on the last day to leave an impression! The ground was wet and lots of RVs got stuck on the departure day. I think these guys with jeeps and winches actually enjoyed getting to put their vehicles to the test. They did successfully get this big RV out of its rut, and it drove away to raucous applause! We can’t tell you much about all the great activities at this rally because we were working! During the week, we presented 8 seminars, listed below. The link for each one will take you to the seminar handouts. Feel free to download them for your own personal use. If you’d like a presentation for your group, contact us. The smartphone topic was the most popular. Standing room only. We needed to take a panorama shot to get them all in! Picasa was still pretty popular as well. We were in a different room for almost every seminar, so we had to get good at carrying all our stuff around. Here’s Jim getting ready to go to work. And, Thank You Connie Bradish! for helping us out with people coming to our table to become Geeks on Tour members. We weren’t there very often. That means it’s partly Connie’s efforts that allow us to welcome 93 new and renewing members to Geeks on Tour this week! As soon as the ground dried out a bit, we pulled out and hit the road, on our way back east to Rapid City and the Safari Rally. The next FMCA convention will be in Perry, Georgia March 17-20, 2014. Hope to see you there! Our first rally of the season was this RVSEF Lifestyle, Education, and Safety conference. It’s the same conference that we’ve done a couple times before in Bowling Green, Kentucky. We taught a few classes, but it’s a very small conference so there was no stress at all. And, take a look at where we were! That’s Pikes Peak in the background. We’re just in the parking lot of the conference facility, so there are no hookups. We’re giving our generator a workout, and learning that our inverter works pretty well. We’re here for 5 nights. I’m not sure we’ve ever dry-camped that long before, and certainly not for a looong time. It’s good practice! This is the conference group, just getting to know each other. Some have been RVing for a while, some haven’t even bought their RV yet. They come here to learn what they need to know – driving classes, electrical system classes, water system classes, lifestyle classes, and technology classes-that’s us! There are some real industry experts here, and Jim enjoyed taking a couple of electrical classes with Gary Bunzer, the RV Doctor. Linda and Howard Payne of RV-Dreams are also here. We follow their adventures and have been especially envious of their recent exploration of Utah’s parks. I hope these conference attendees know just how lucky they are! This conference had less than 30 attendees and therefore the classes had no more than a 10 to 1 student/teacher ratio. And the teachers are all experts in their fields. To see these folks at the big rallies, you have to get in line with hundreds of other attendees. Here at the RVSEF conference, I saw Walter Cannon, Executive Director of RVSEF visit the RV of one attendee and show him how to measure the tow bar drop to see if it was appropriate for his car. During a break between seminars, I overheard Gary Bunzer, The RVDoctor, helping someone troubleshoot an electrical issue they have in their RV. Here’s Gary and Walter during an open Q&A session at the conference. And no RV safety conference is complete without Mac the Fire Guy! When we were asked to present one of our seminars to the Roadtrek Technology and Camping Rally, we accepted just because it was on our route and scheduled at the end of the season after all our other obligations were over. We knew it would be a small rally and didn’t expect it to be very memorable. Little did we know that we were saving the best for last! Outside of our own TechnoGeek Learning Rally, this group was the most eager for Geeks on Tour information! We were originally scheduled for 3 hours on the first morning of the rally, but they ended up giving us the floor both morning and afternoon of the second day as well. We welcomed 10 new members to Geeks on Tour. Out of a group of 24 rigs – I think that’s our highest percentage yet! We handed out free trial copies of Streets & Trips and showed them how to use it along with the POI megafile. We demonstrated Dropbox as an example of Cloud Computing. We also demonstrated Google Drive where we could both edit one online document simultaneously. We showed them smartphone and tablet apps like the free Google Translate, and how to scan Barcodes. We just kept on showing them all our favorite stuff like face recognition in Picasa, making a blog with Blogger, and they ate it up. Several of them wanted details when Jim showed off his new Microsoft Surface Pro. The main selling point is that this is a tablet that is also a full-blown Windows computer so it can run programs like Quickbooks, Picasa, Streets & Trips etc.. It is Jim’s main computer now. It’s a tiny tablet to grab and go, but when at his desk he uses an external monitor, keyboard and mouse for a full desktop experience. If you’re interested in buying one, there’s an Amazon ad at the bottom of this post. If you click that and buy – we’ll get a few dollars. Jim’s Surface Pro (the little screen in the middle) with external monitor, keyboard, and mouse. By the second afternoon, we didn’t even present any particular topic – we just opened it up for any and all questions. Stump the Geeks! They got us once, but Google came to our rescue and we gave them their answer after all! The Roadtrek group playing Stump the Geeks! They didn’t let us go before we agreed to return for their Chapter rally in February 2014! It’s on our calendar now. It will be held at this same park – Tropical Palms in Orlando. We really enjoyed these Roadtrekers! We had a great time … Thanks to Dave Gottdiner for inviting us! p.s. If you want to invite us to your event, here’s the Request Form for Scheduling the Geeks at your Event. Marion Kerns was not happy when her husband, Karl, said he signed them up for a computer learning rally. She told him that she would just stay in the RV and do her quilting while he went to class. But no, that wasn’t Karl’s plan! He made her come to class along with him. By the end of the week, Marion was seen carrying her iPad with her everywhere. With a little extra encouragement in a one-on-one session, Marion had learned enough to open her eyes to new uses for her tablet computer, but what she liked most about the rally was the small size. With only 20 couples who shared breakfast and dinner each day of the rally, she said it felt like family by the end of the week and she truly enjoyed herself. Good job Karl! It’s called the TechnoGeek Learning Rally and it is co-hosted by Geeks on Tour and TechnoRV. RV travelers actually use technology more than average seniors because it is just so useful to our lifestyle. Whether it’s GPS technology for getting us where we want to go, or cellphone/smartphone technology for keeping us in touch wherever we are, RVers are quick to adopt. And then there’s the photos! We like to have good cameras and take lots of photos of our travels. Learning about the different settings on our cameras help make those pictures better, and then using Picasa afterwards can improve them even more. Some people came to the rally to learn how to make a blog. Larry and Marilyn Vanstone have already been keeping a blog about their RV lifestyle – The Amazing Vanstones. Yesterday for example we first learned about the cloud before taking our first class on Picasa photo editing. Then an hour on smartphones followed by more Picasa, then Internet on the road. I’ve used Picasa on my blogs since 2006 but yesterday I learned more in 90 minutes then I did in 6 years on my own. As more and more of us get smartphones, they are becoming our primary computing device, and there is SOO much to learn about them. John and Kathy Huggins are no strangers to technology, they have been producing a weekly Podcast about their RVing lifestyle for several years. It’s called Living the RV Dream. They came to the rally to learn about their smartphones and whatever else they could pick up. Listen to their podcast about the Rally to hear about their experience as well as a few people they interviewed. Even the games had a learning slant. One evening, the group played Jeopardy, where all the questions were about topics they were learning at the rally. The last evening, each dinner table played ‘Catch Phrase’ using a free App downloaded to one person’s smartphone, then just passing the phone around the table. 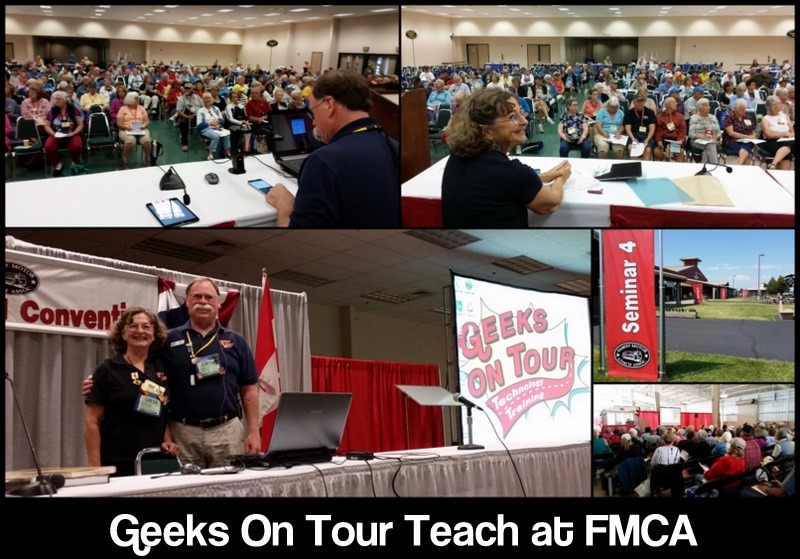 The next TechnoGeek Learning Rally is tentatively scheduled for March 24-29 in Bushnell, Florida. If you’re interested, please leave a comment here.